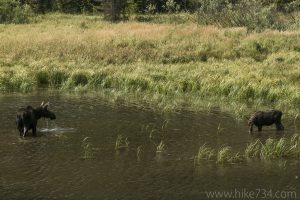 The aptly named Moose Pond is frequented by moose that are attracted to its abundance of food. Head west on the Jenny Lake Loop trail crossing the outlet of the lake. The trail parallels the lake shore, alternating between filtered and open views. After a brief section in the trees, the signed trail for Moose Pond takes off to the left and drops down to the edge of one of the main ponds. Return via the same way, or continue on the trail that loops around the Moose Pond. This loop visits a couple of other ponds and adds another, fairly level, 1.3mi/2.1km to the hike. Trailhead: Head west towards the Jenny Lake Visitor Center at the South Jenny Lake Junction and turn right into the Jenny Lake Visitor Center parking area. 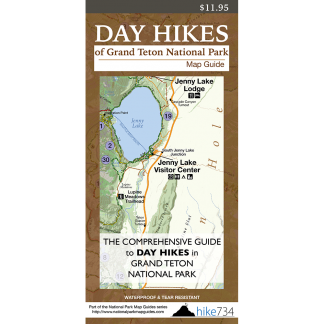 Head to the Jenny Lake Loop Trailhead at the west end of the parking lot.